Are you looking for the best, most comfortable Winter socks for boys and girls? Do you want a pair of Winter Warm socks that will keep your child's feet warm and comfortable all day while Winter? Then the NOVCO Children's Winter Socks are for you! Our Snowflake Patterned Socks have a stylish design,Each order comes with 6 pairs kids socks for toddler girls in assorted patterns. MATERIAL: 60%Cotton.25%Wool,15% Polyamide. 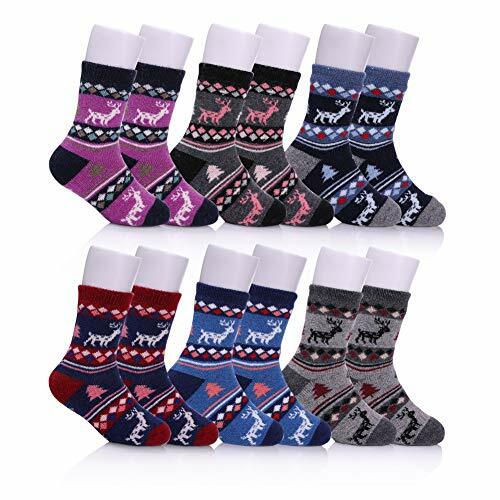 Soft and Comfortable fit Autumn or Winter!these are nice soft socks,thick material and they keep their shape well.that sure will keep little feet warm this winter. CHILDREN'S SOCKS SIZE : the kid's socks we offer 3 sizes for your choice, S:1-3Y, M: 4-7 Y, L: 8-12Y. Stretchy design of the socks won't keep the socks too tight for your kids, will not leave red marks on their feet or cause some uncomfortable feelings. CUTE AND SWEET DESIGN: Cute design socks, cute pattern make the little kids fall in love with these socks.these socks will just THRILL them! Offer our of Warm socks as a birthday, Christmas or impulse gift and enjoy little adventurers' wide smile upon unwrapping the package! COMFORT & STYLE FOR YOUR LITTLE ANGELS! Keep your kids' feet warm and comfy with our premium children's Winter thick socks and take Winter Warm performance to a whole new level! RISK FREE GUARANTEED - Your purchase is fully protected when you order today. If you are not satisfied with your socks, Contact us any time, We will get you back within 24 hours try our best to make things right. If you have any questions about this product by NOVCO, contact us by completing and submitting the form below. If you are looking for a specif part number, please include it with your message.